While in Boquete, Panama, I stopped by one of the local coffee farms to learn about how some of the world’s most delicious coffee is made…and tried a few samples. It was perfection! 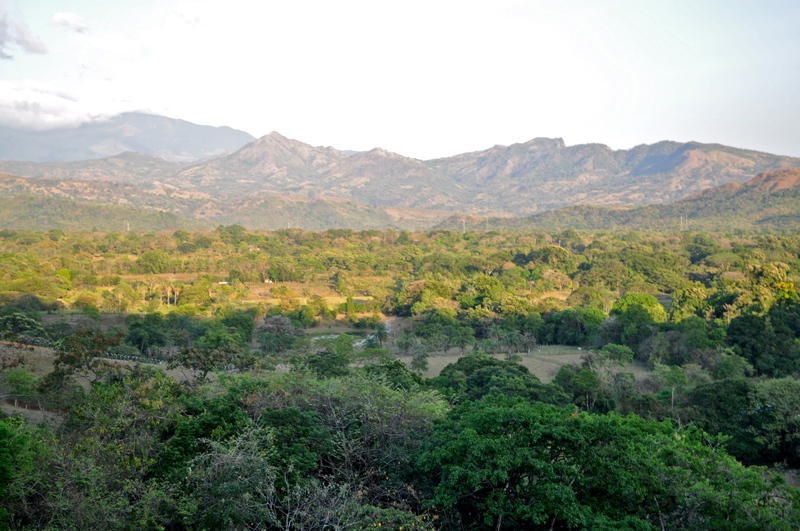 Horseback Riding in the hills of beautiful Boquete, Panama. We spent a day exploring the area on horseback with ‘Franklin’s Horseback Riding‘ and also hiked to a peaceful hot spring. This ‘Horses & Hot Springs’ tour was the perfect way to spend a day in Boquete! With so many tour options available in Boquete, Panama, the hardest part is choosing what you want to do in this beautiful hillside town. After looking at a number of tour options, we decided to go with Horses and Hot Springs and booked an afternoon with Franklin’s Horseback Riding Tours. 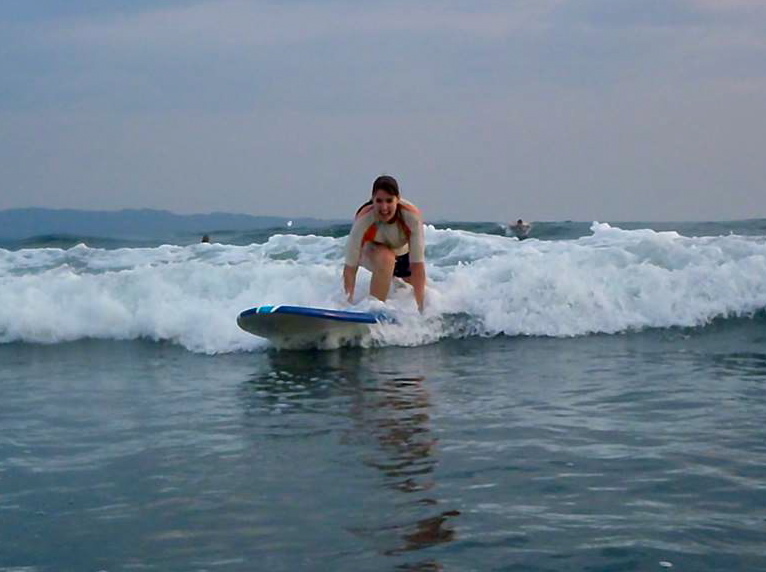 Sounds easy, but my first attempt at riding a wave in Santa Catalina, Panama did not go quite so smoothly. 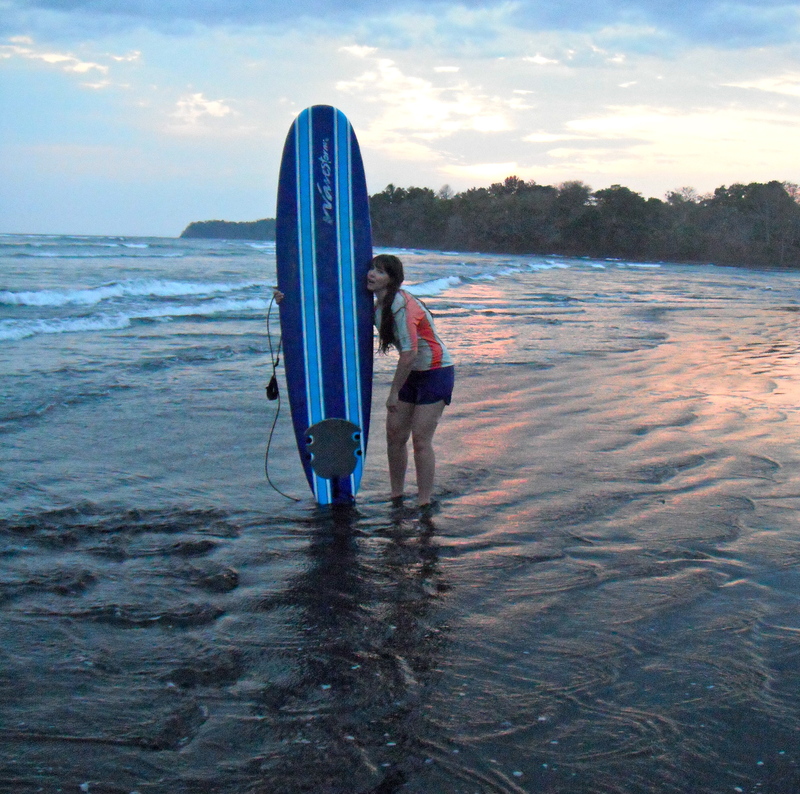 I had always wanted to learn how to surf and since Santa Catalina is known to be one of the best surf spots in Central America, I figured it was time to cross another item off my travel bucket list. Surfers have always intrigued me with the whole beach bum, free-spirited, laid back attitude of spending your days outside, riding waves in the warm sun. 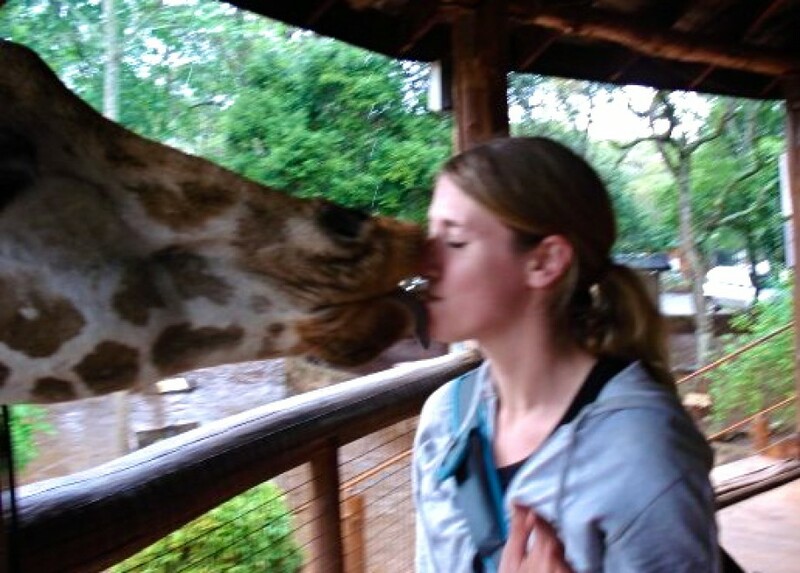 While this may just be a stereotype, it sure sounds like the perfect life to me. After checking into Sherlley Cabins, our Santa Catalina home, my travel companions and I headed out to the beach to check out the waves and cool off after a long day on the bus. Here, we came across a few people learning to surf who introduced us to their instructor, Chris Johnson. We made arrangements to meet him the following day at three to turn our surfer dreams into reality. Santa Catalina is a small fishing village on the Pacific coast. With a population of only 300 people and 50 expats, this surf paradise has a very laid back vibe with small hand-thatched restaurants and cabins – just don’t expect to party all night, as all the local bars have a curfew of 10 p.m.
We rented a surfboard at the Santa Catalina Surf Point for $7, paid $20 for our lesson, and headed down to the beach. Chris told us he’s originally from Florida, has been surfing since he was nine and now owns the Montezuma Surf School in Costa Rica. So we were definitely in good hands for our intro to surfing! He started out by drawing us pictures in the sand of what the waves look like and how we were going to catch them. After showing us the proper position and how to “pop up” onto the board, we each got our own hand drawn ‘sandboard’ to practice our pop-ups on. On land, I could pop up no problem and started thinking maybe this wouldn’t be as hard as I imagined. Then we left the sand behind and picked up our boards, attached our ankle strap, and headed out into the waist-deep water to try and catch our first wave. Chris showed us how to pick a wave and what to look for as it was coming in. Then, one at a time, he helped us as we got into position to wait for our wave to reach us. Then he’d guide the board and yell ‘NOW!’ at which time we were supposed to pop up and ride the wave! Well, it turns out it’s definitely not as easy in the water as it was on my ‘sandboard.’ My first attempt was pretty dismal. My second was a little better – I at least got to my knees as Chris told me to let go of the board and stop over thinking it. By my third attempt, I was up on the board, crouched very low and still holding onto the side of it – but at least I was on my feet! For the next couple hours, we continued to pick our waves, gradually starting to paddle on our own and then do the whole process alone, with Chris just offering tips after each ride. He definitely knows what he is talking about and was an awesome instructor for our first time surfing. I won’t say by the time the sun was setting three hours later that I was heading for the pros, but I can say that I at least had a few good rides, standing up for several seconds each time before losing my balance and sliding off my board. The day ended with a dinner of fresh fish at Mama Ines, watching the sunset and chatting with Chris and some other surfers about riding the waves. It was a perfect day out in the Santa Catalina waves. 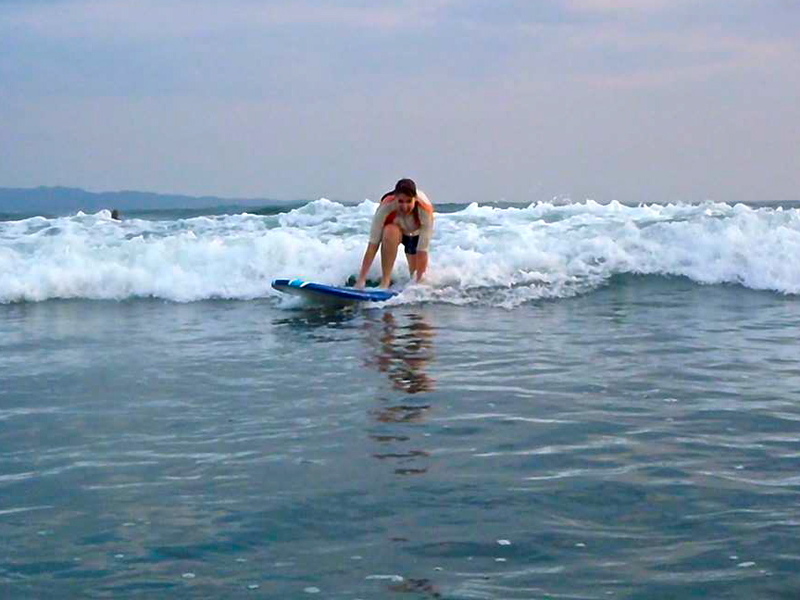 I can’t wait to get back out on a surfboard and try again! I’ve always wanted to try surfing, so on a recent trip to Panama I decided to try and catch some waves in Santa Catalina, one of Central America’s best surf spots. While I may not be joining the pro league anytime soon, by the end of my lesson with Chris from Montezuma Surf School, I did manage to catch a few waves!! Demonstrating how the locks work. 2014 marks the 100th year anniversary of the Panama Canal. Known as one of the world’s greatest engineering feats, the Panama Canal is 80 km long stretching through the country from the Atlantic to the Pacific Ocean. It took more than 75,000 workers over ten years to complete. Finally, on August 15th, 1914, the SS Ancon officially inaugurated the Panama Canal. Currently around 14,000 vessels pass through the canal each year and since it opened over 1 million ships have made the journey through the canal. Ships passing through pay according to their weight. The average fee is around US$30,000. The most expensive ship to pass through was the Norwegian Pearl cruise ship, which paid US$ 376,000 in 2010. This fee has since been surpassed. The cheapest fare was US$0.36 paid by Rich Halliburton in 1928 when he swam through the canal! Panama took over full operation, administration and maintenance of the canal on December 31st 1999 and they are currently working on a US$5.25 billion expansion project. You can visit the Miraflores Locks visitor’s centre (admission $15) which has a four-story museum, viewing platforms and a movie theatre showing a 3-D movie about the locks.